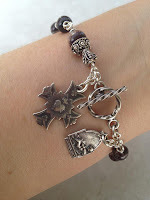 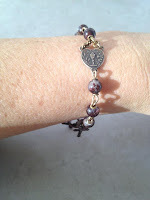 My new style chainwork tenner~bracelets in sterling silver with One Our Father and ten Hail Mary's divided by a rosary centre which is the focal point when worn on the wrist. 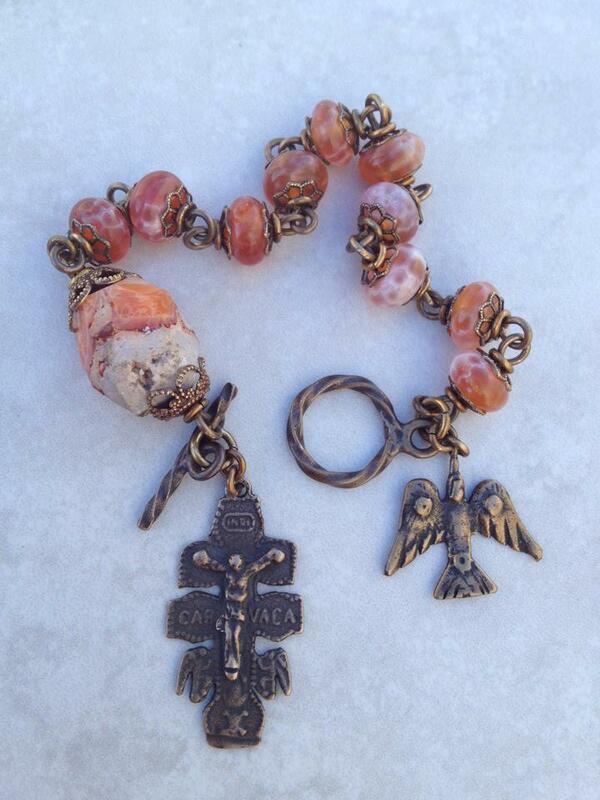 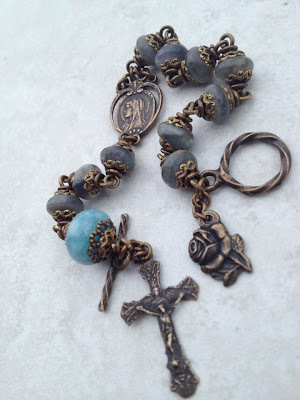 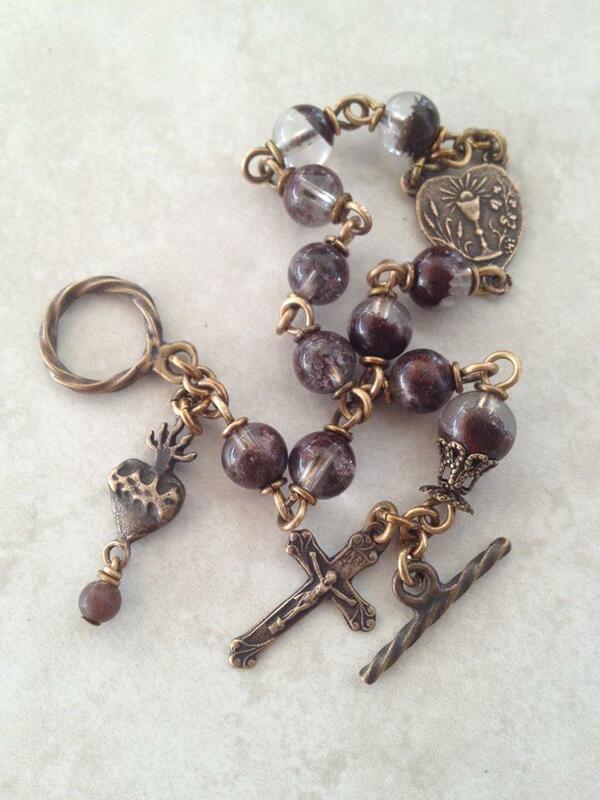 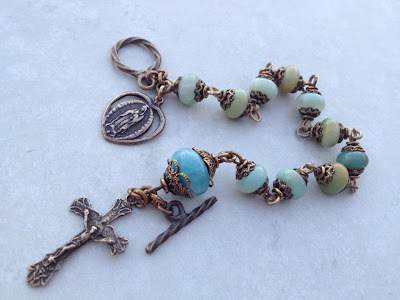 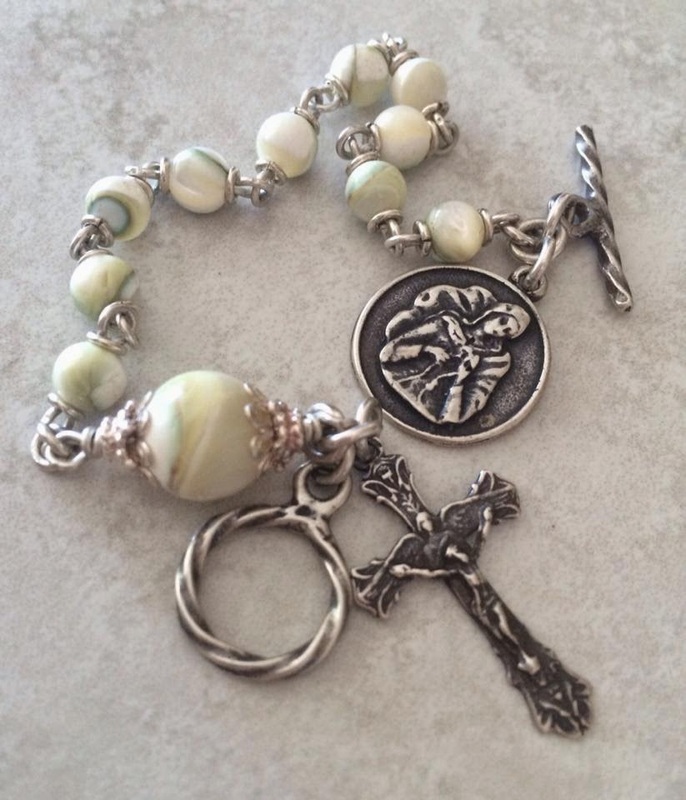 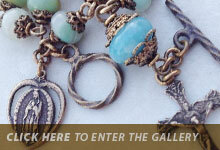 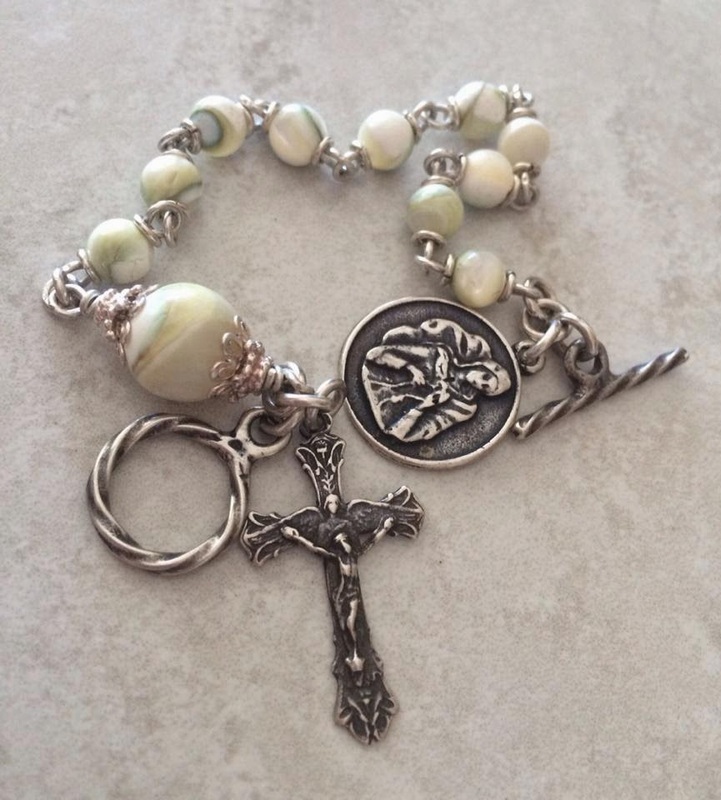 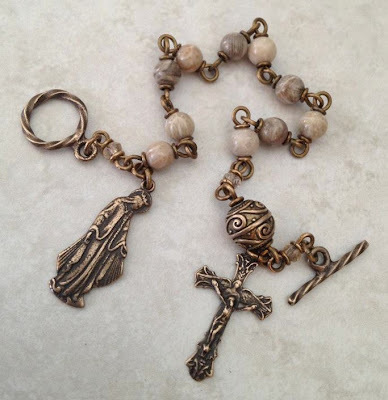 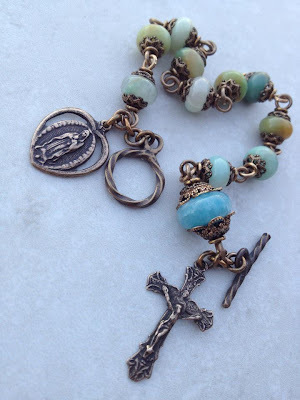 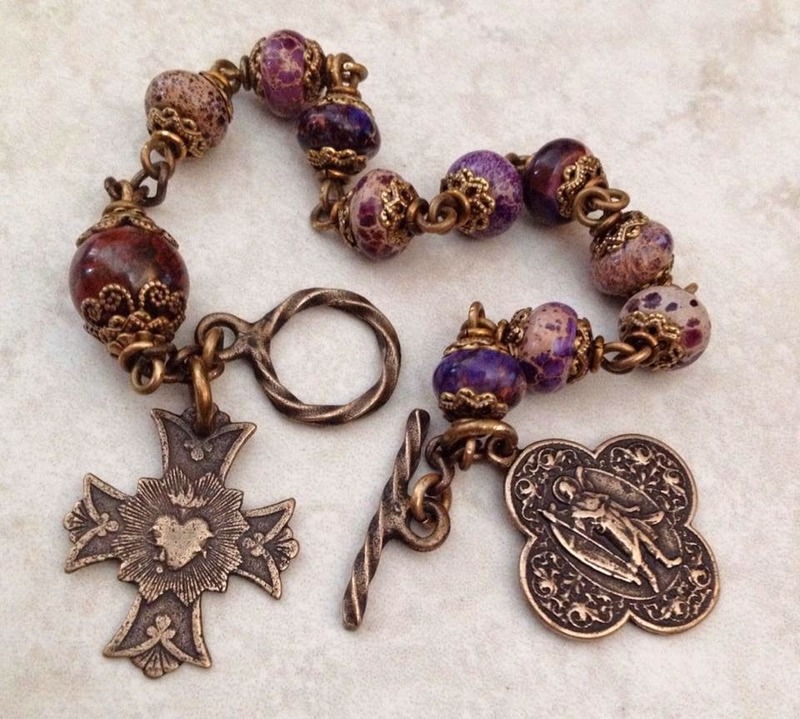 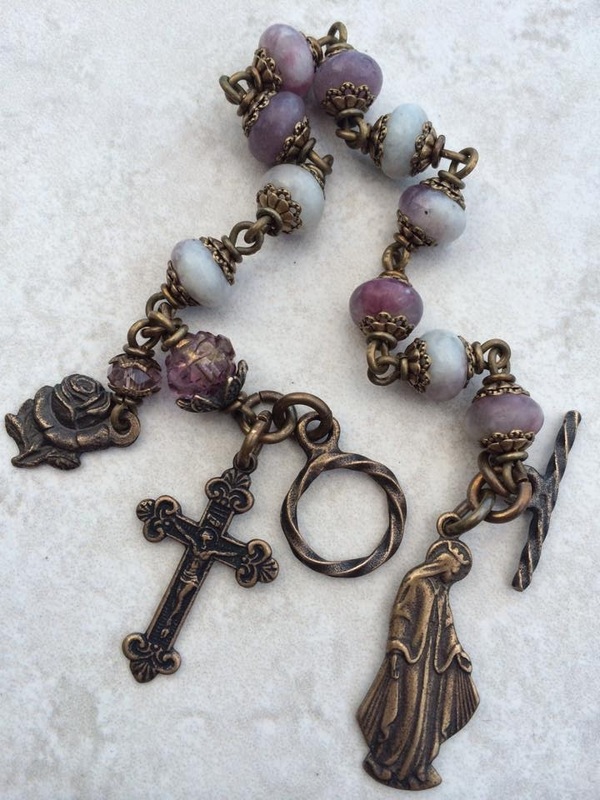 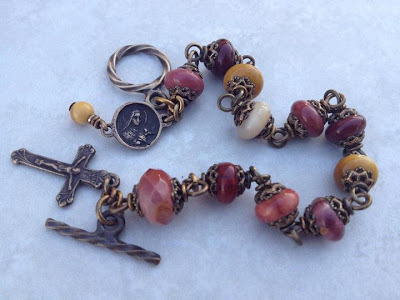 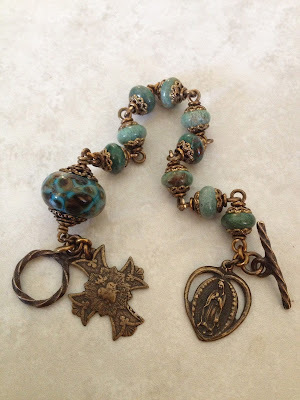 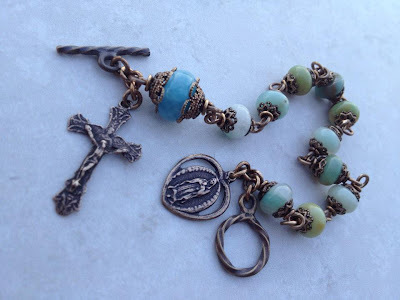 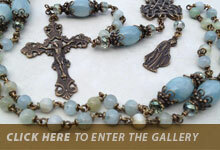 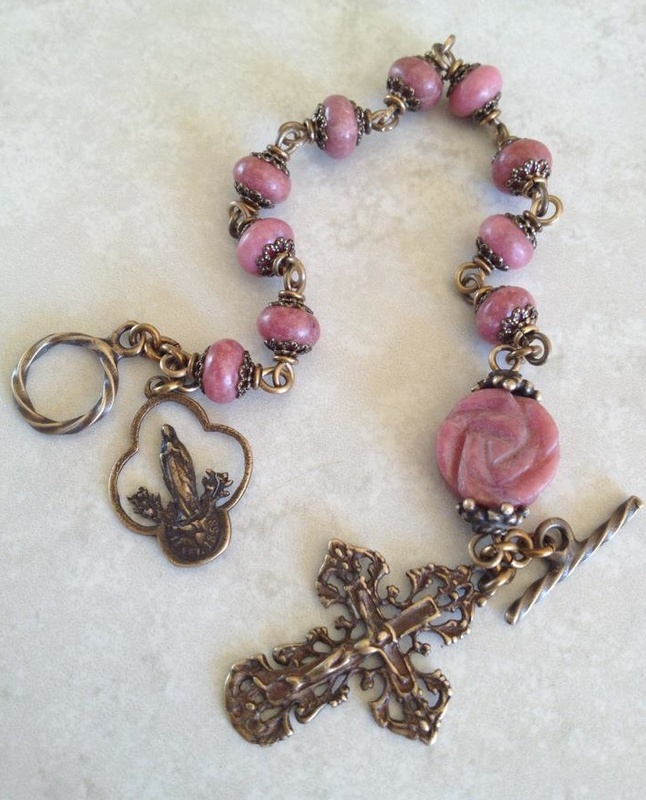 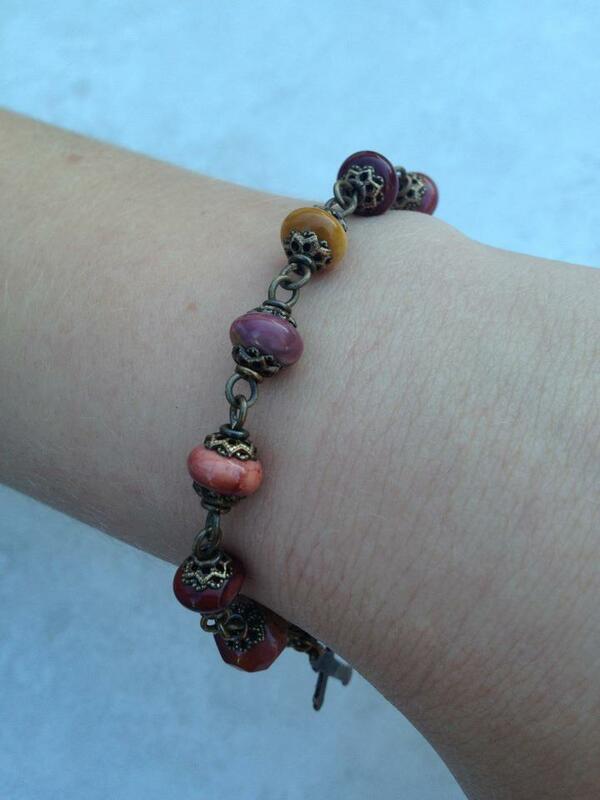 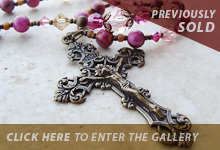 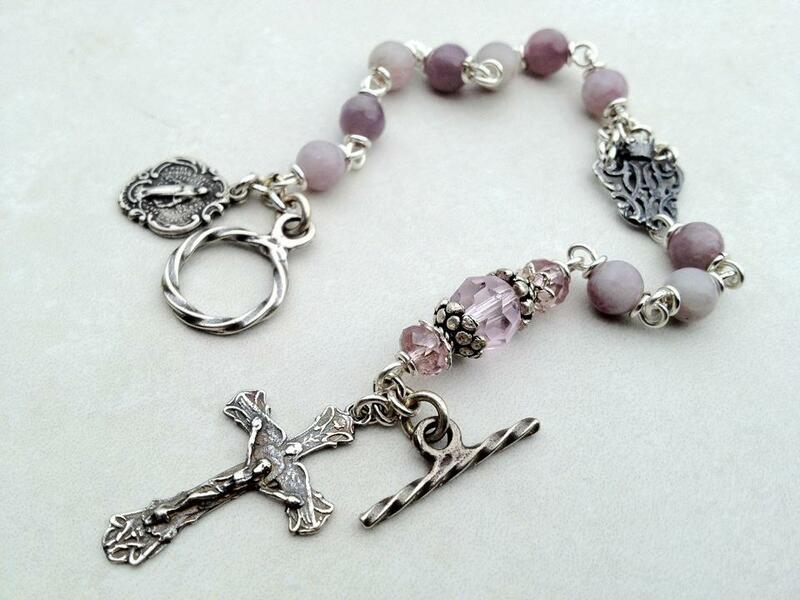 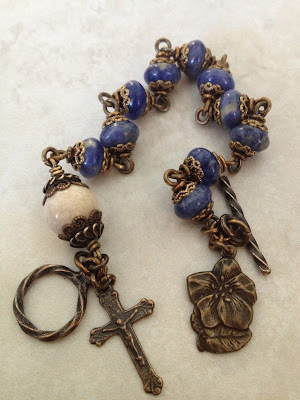 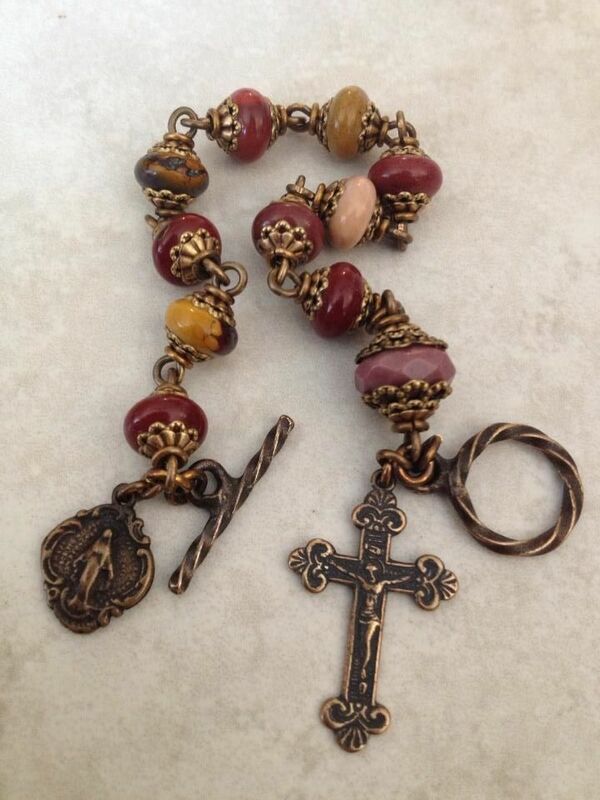 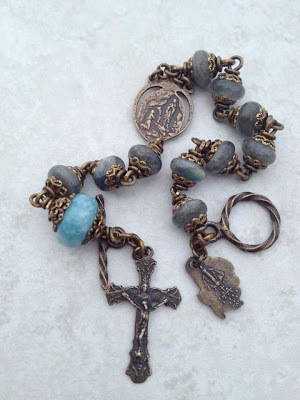 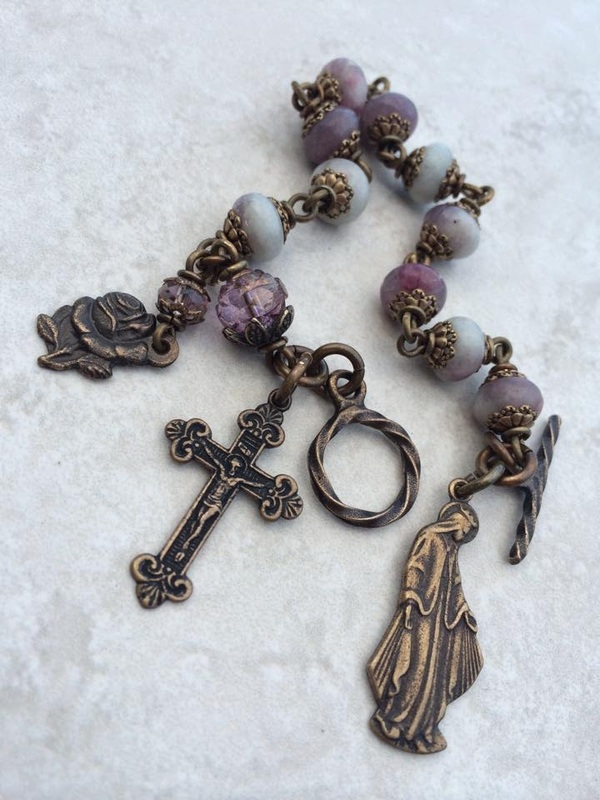 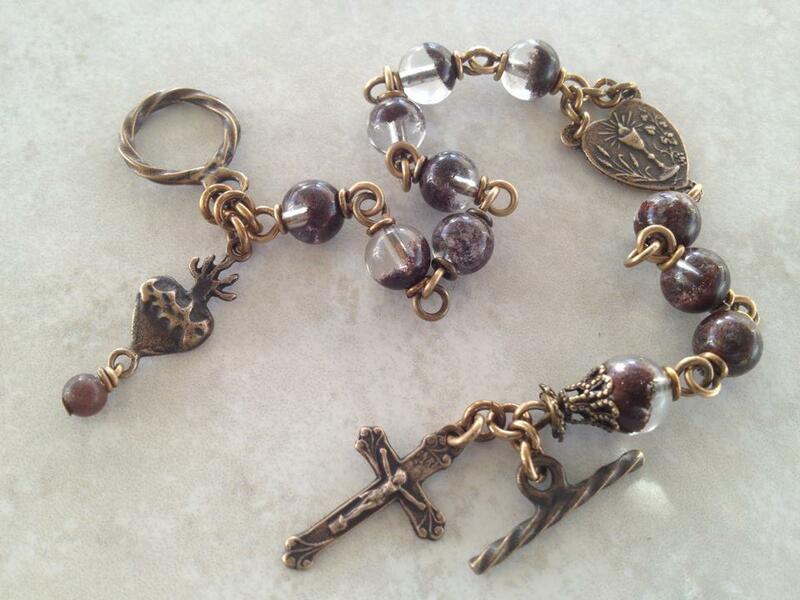 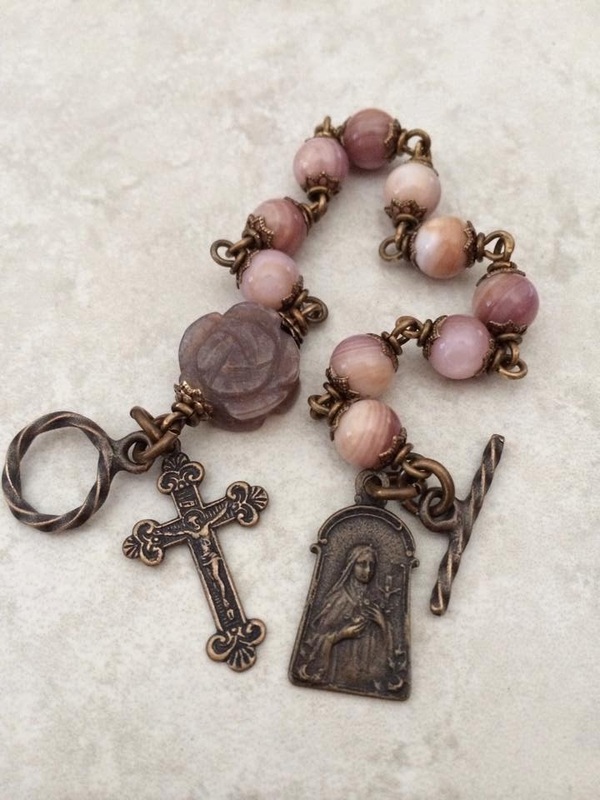 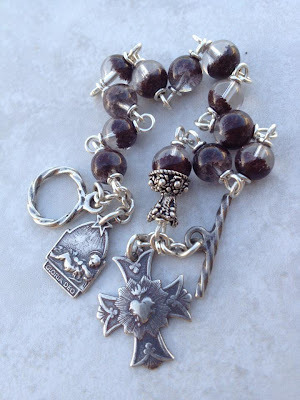 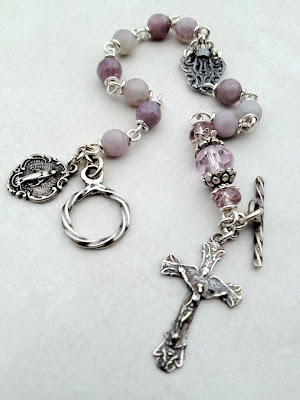 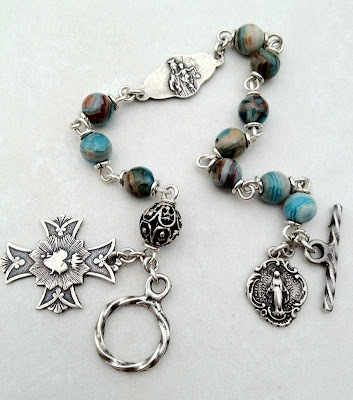 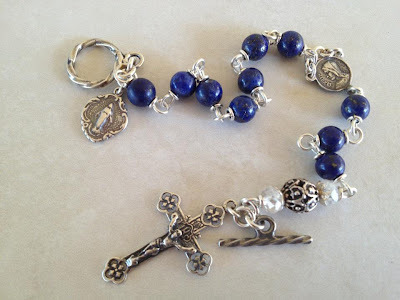 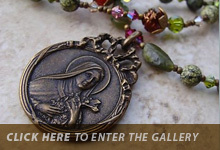 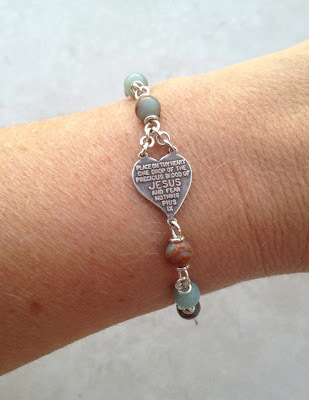 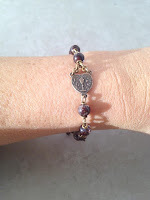 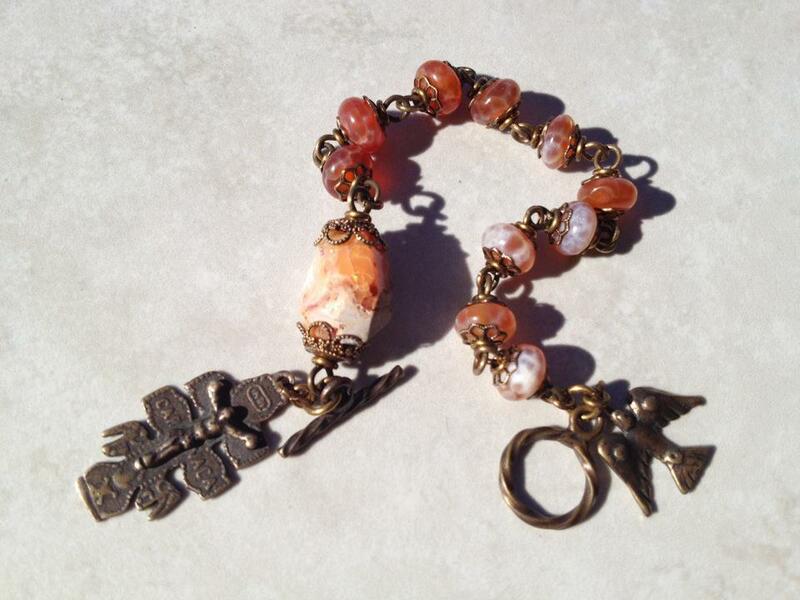 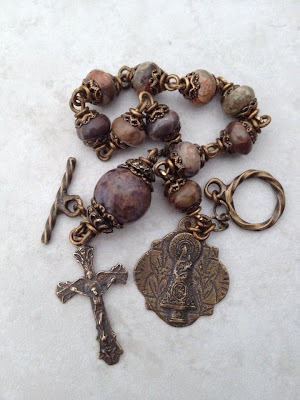 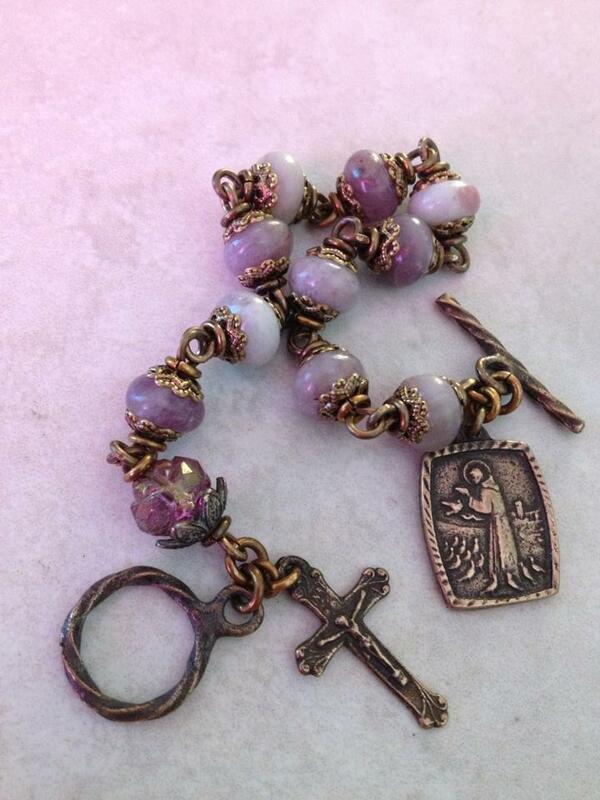 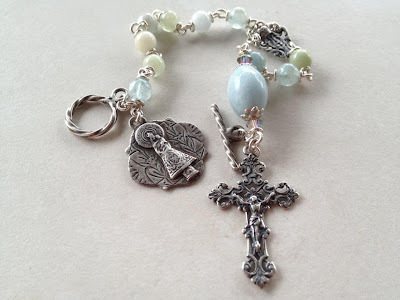 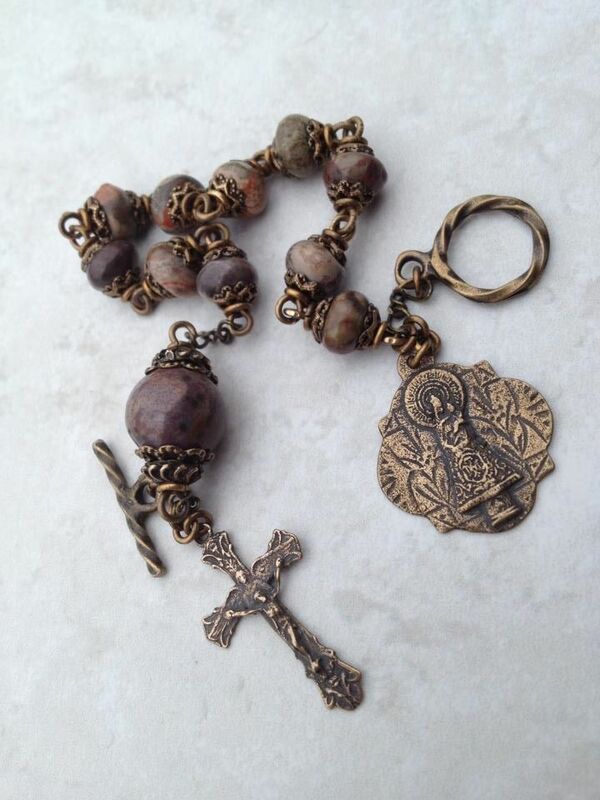 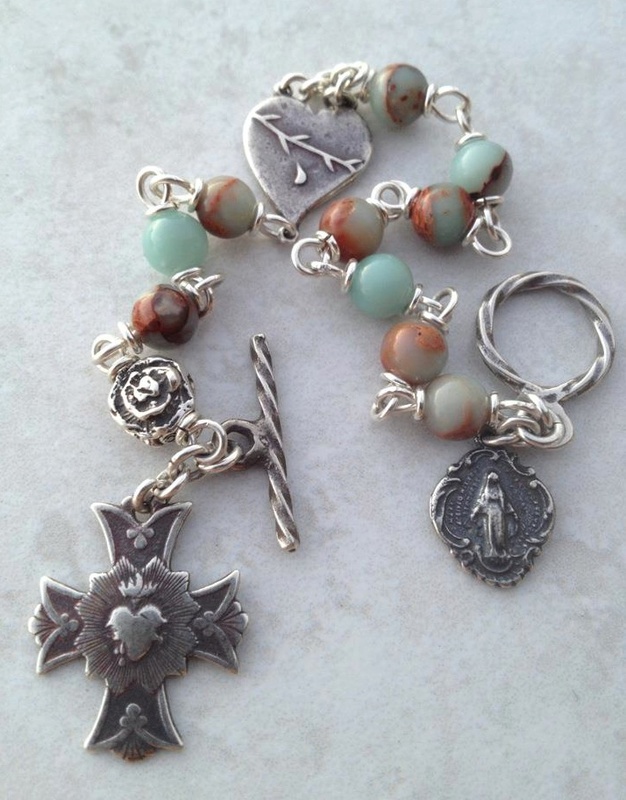 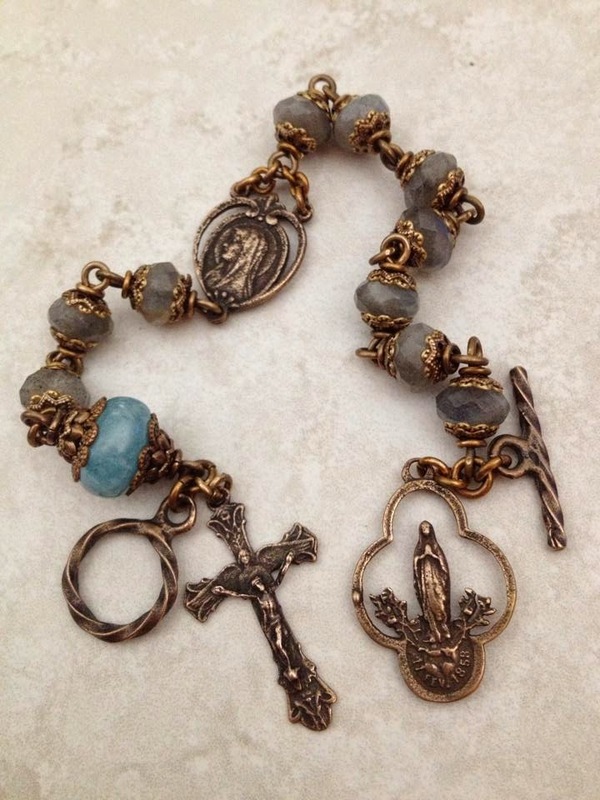 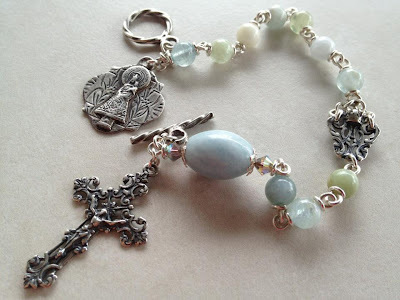 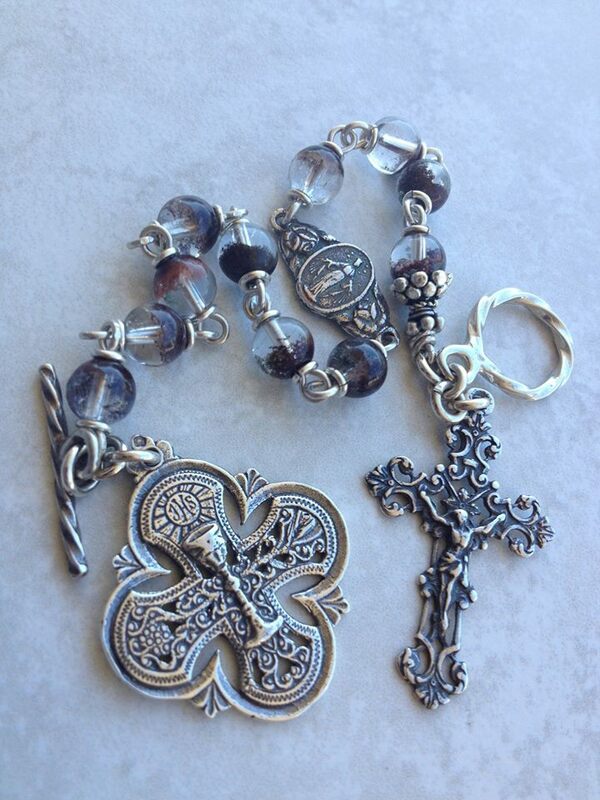 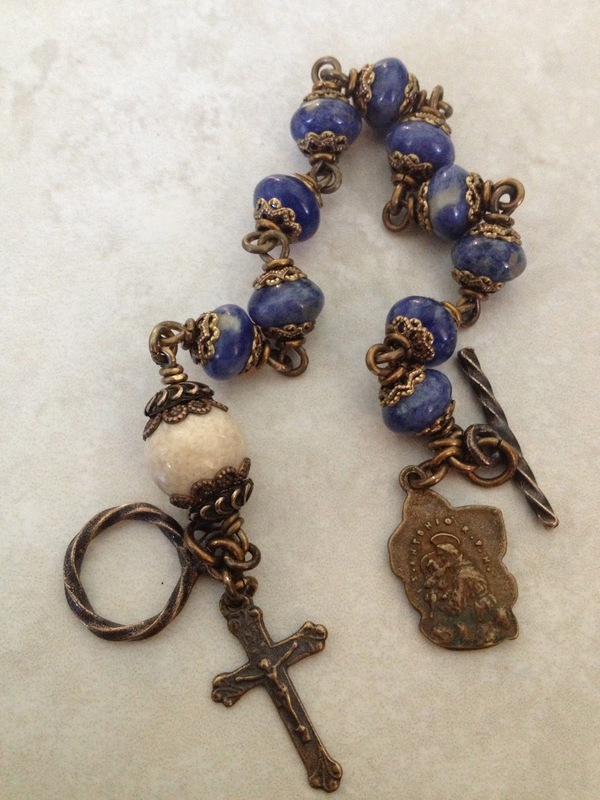 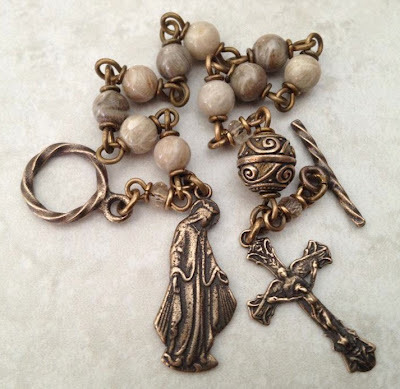 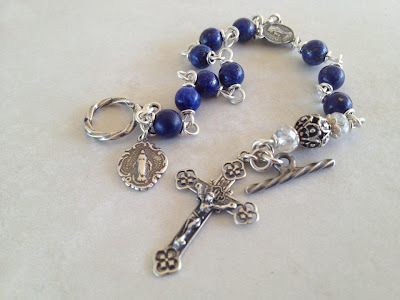 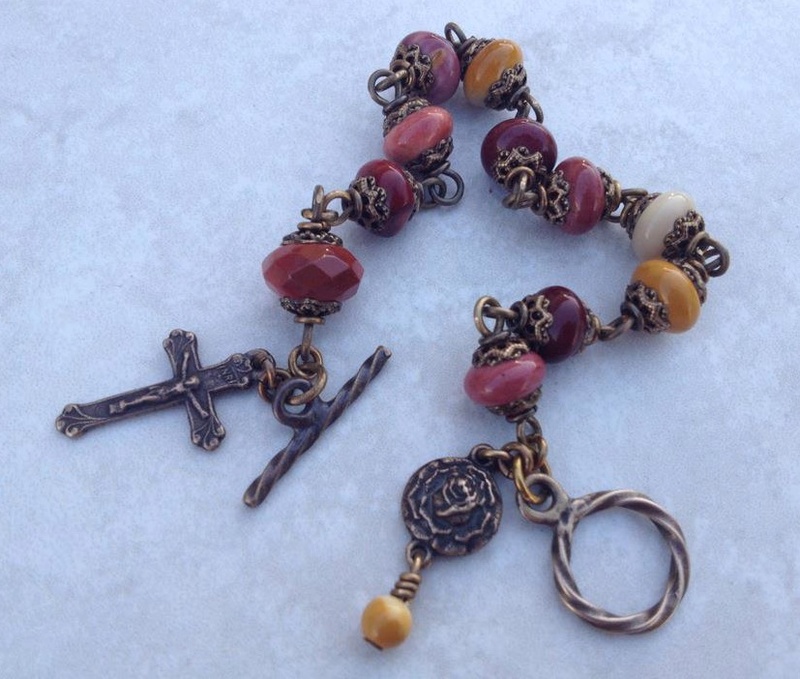 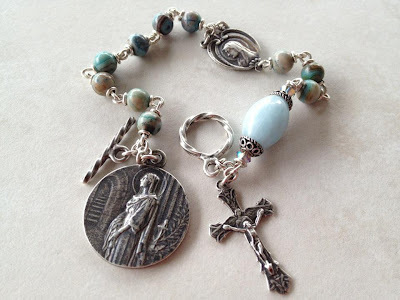 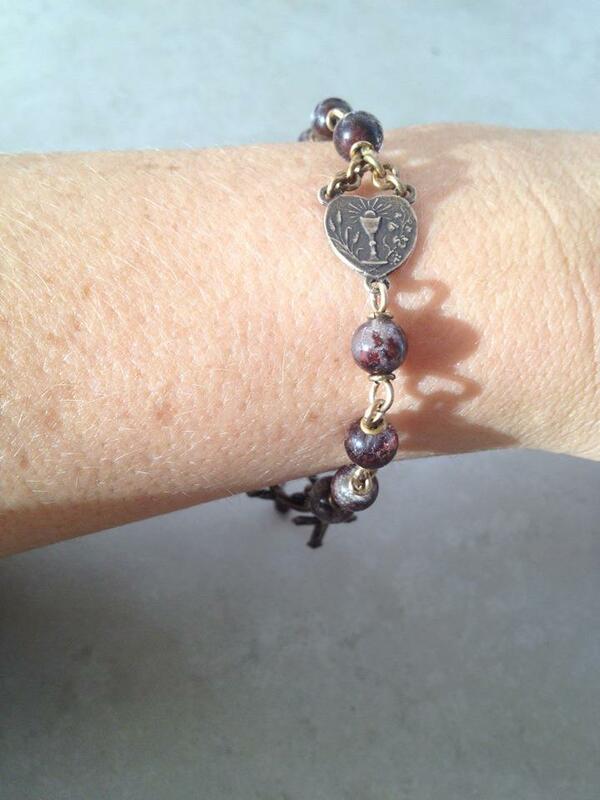 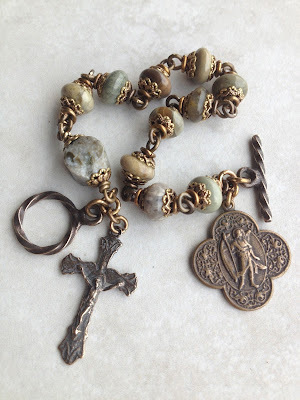 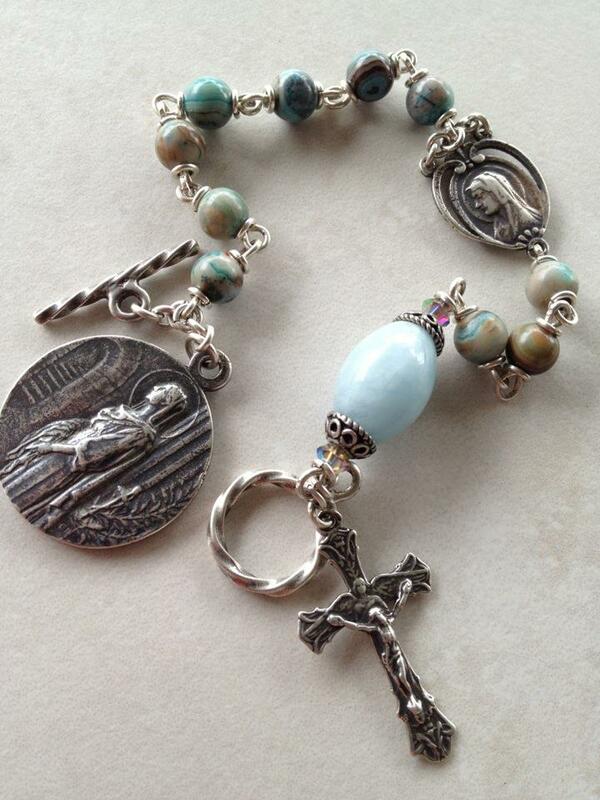 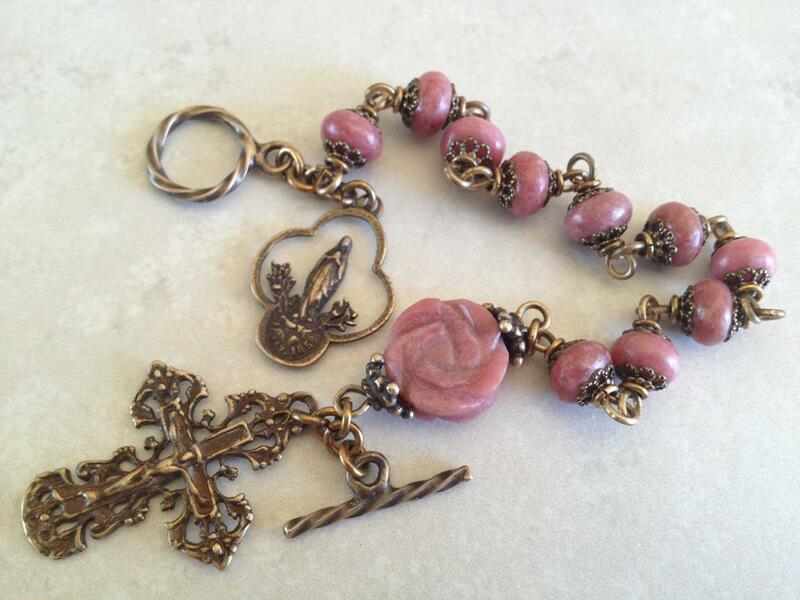 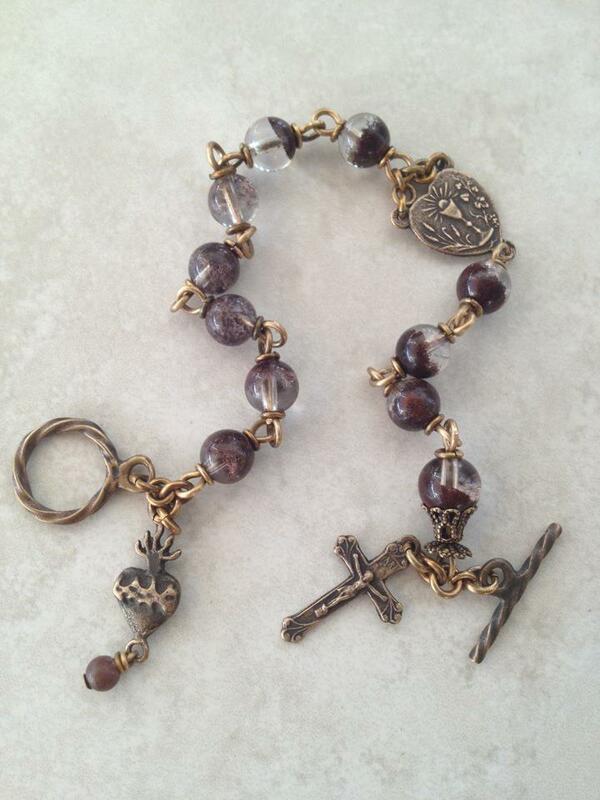 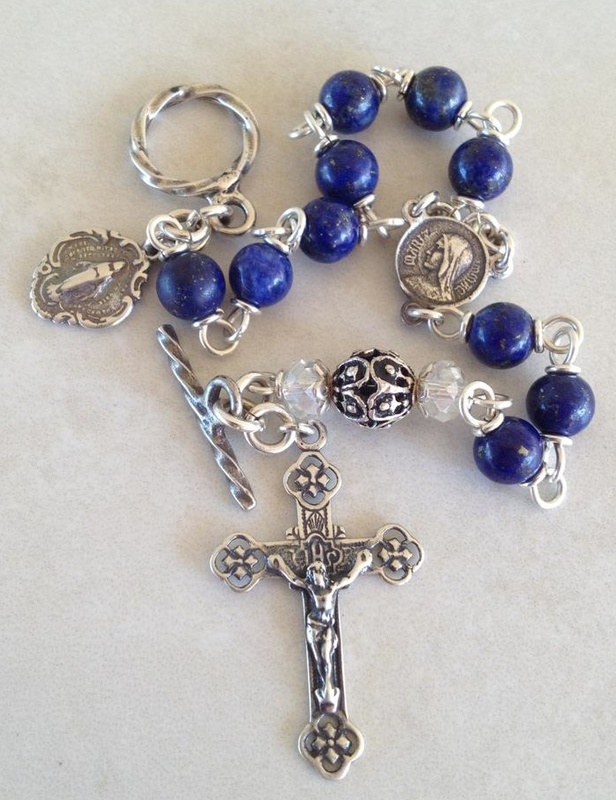 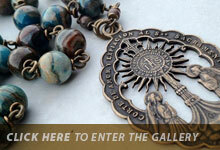 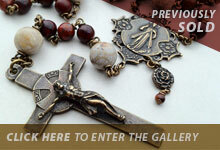 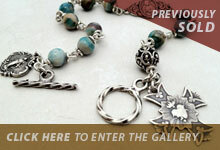 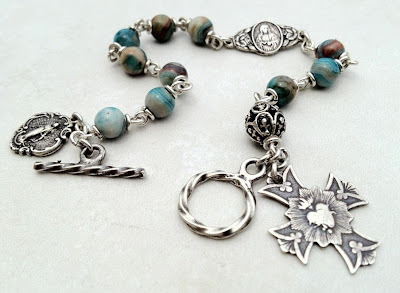 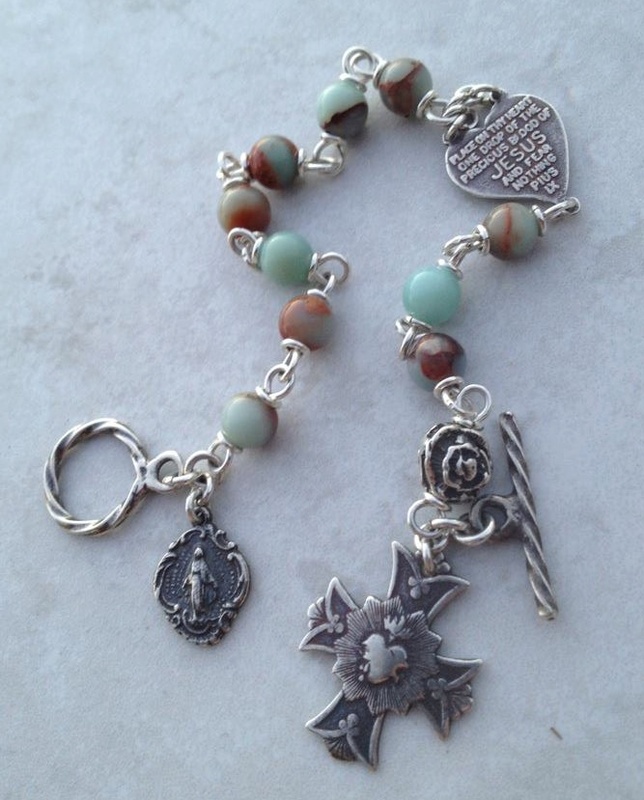 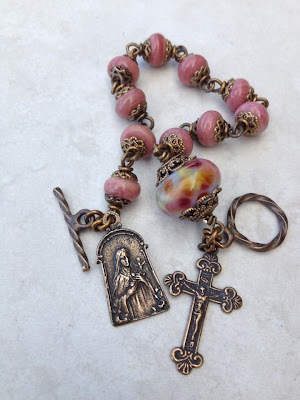 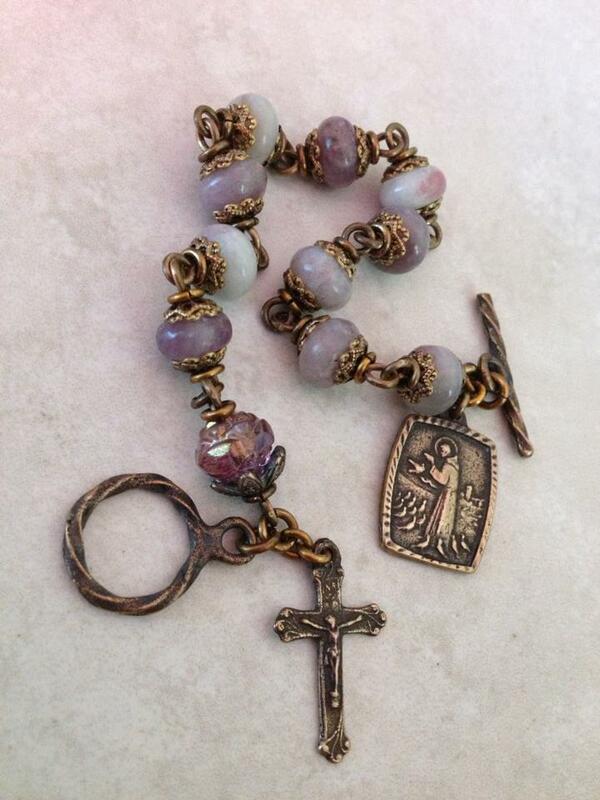 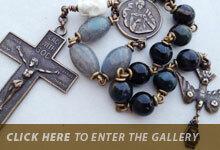 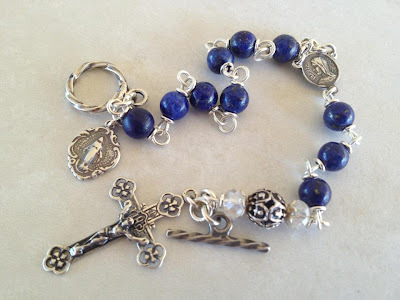 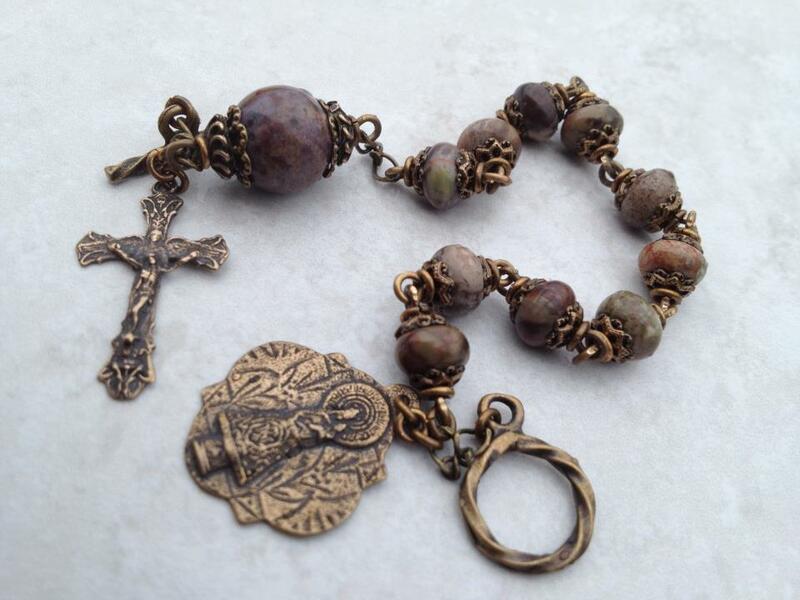 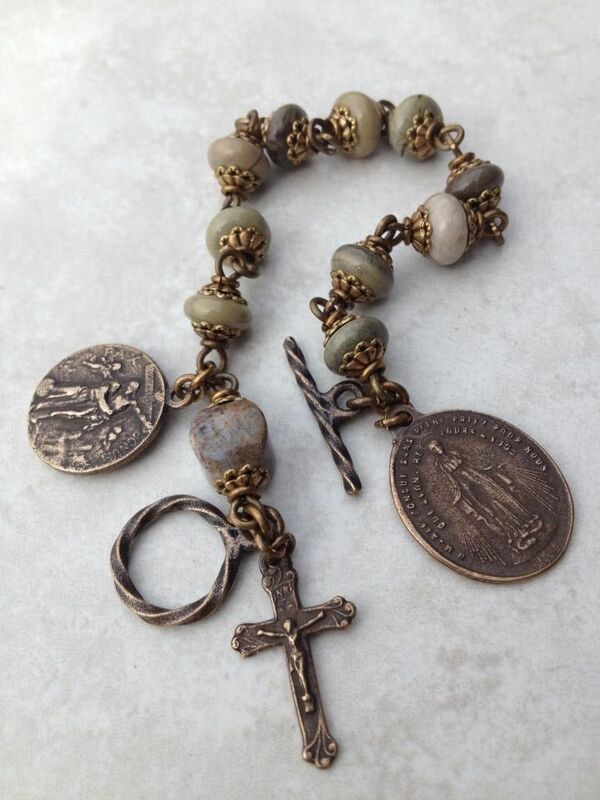 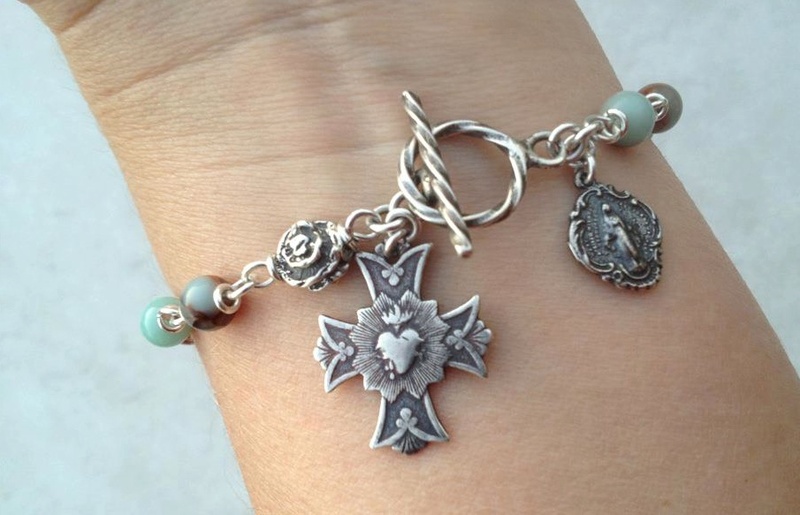 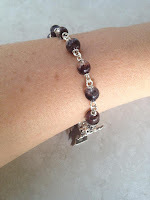 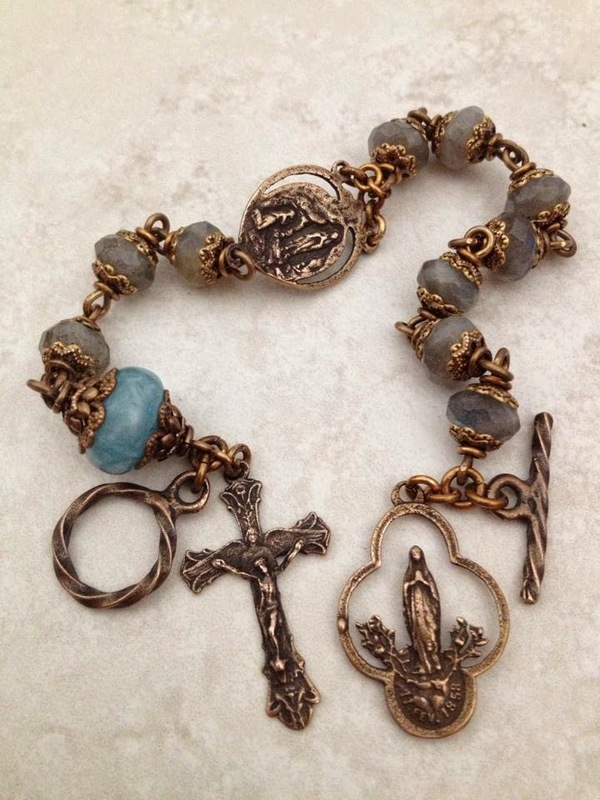 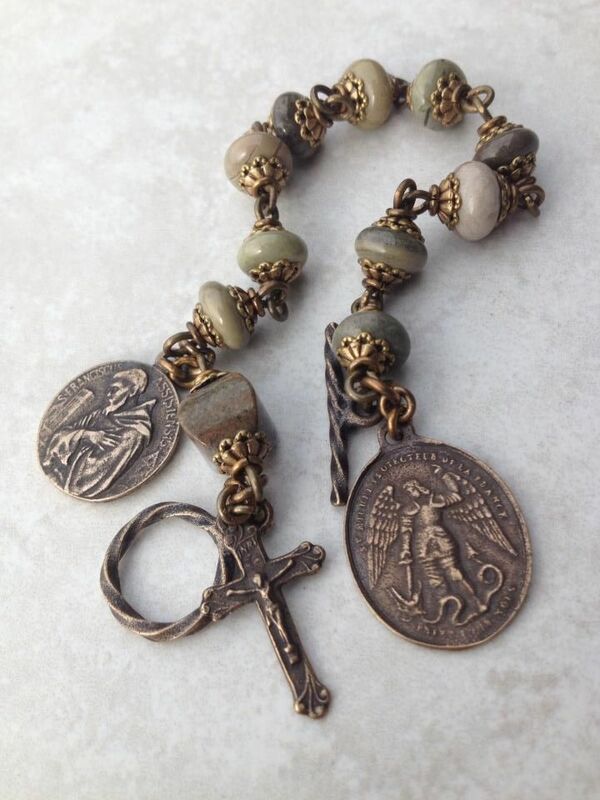 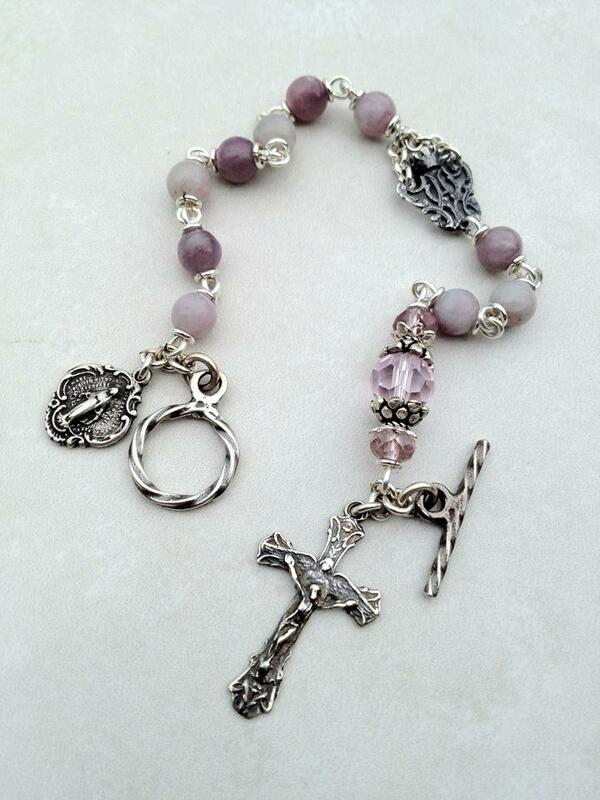 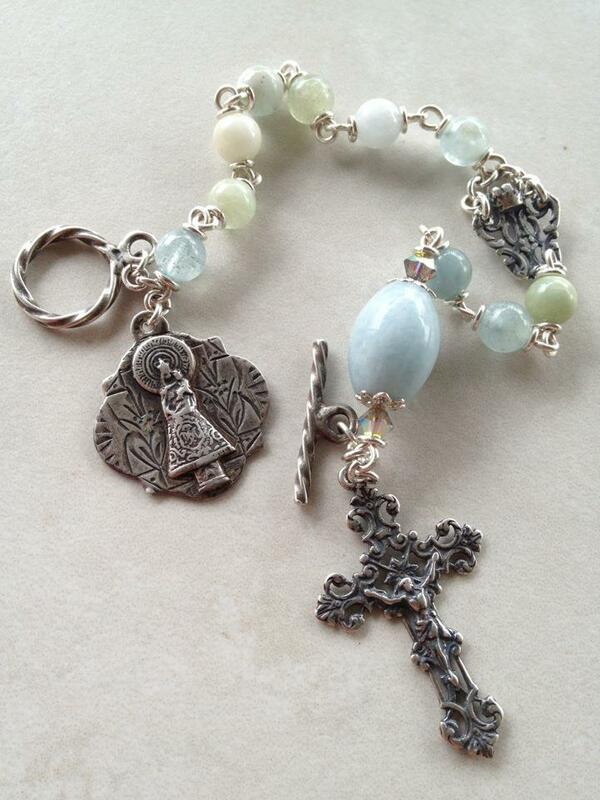 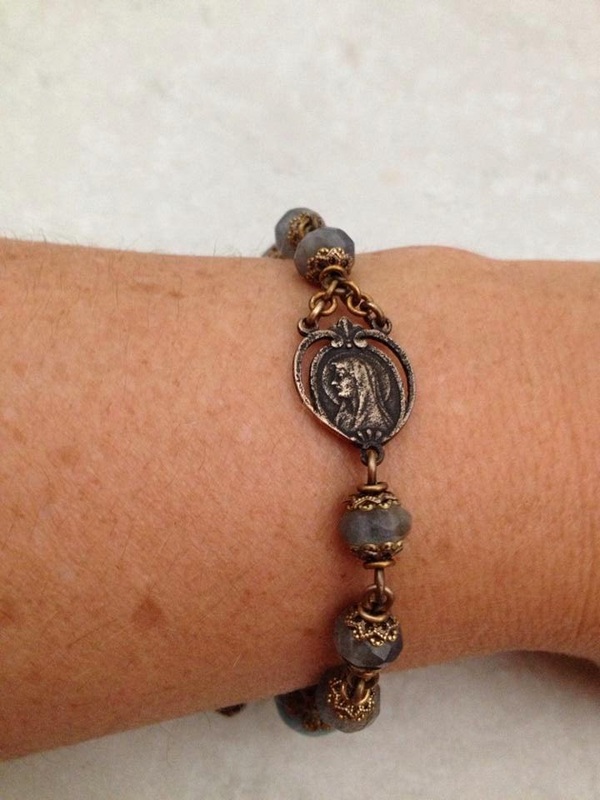 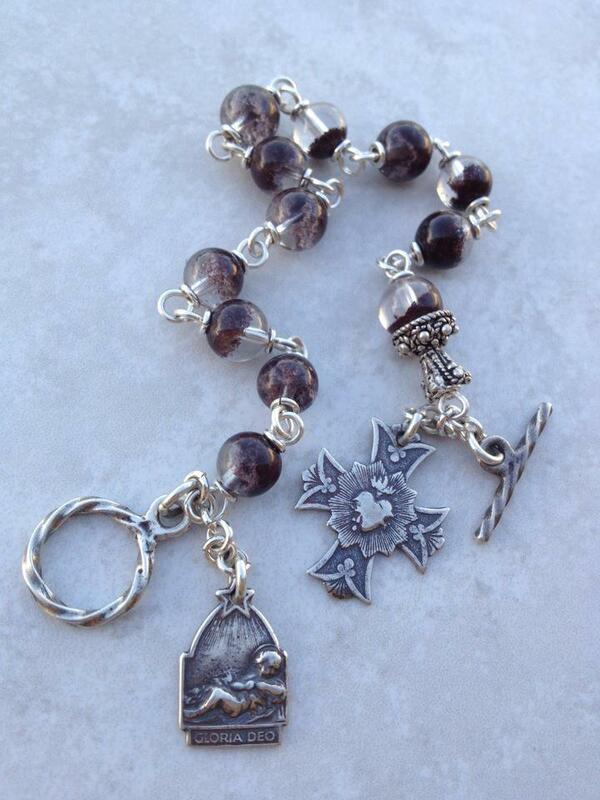 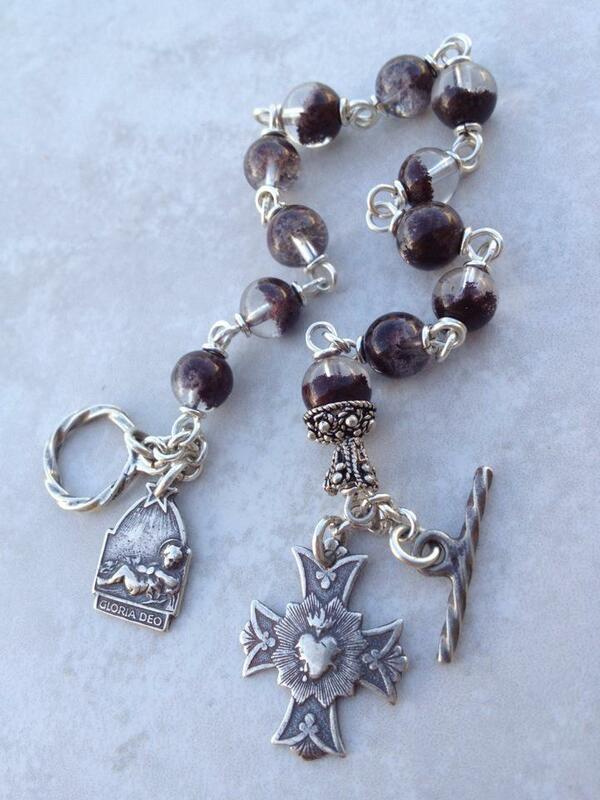 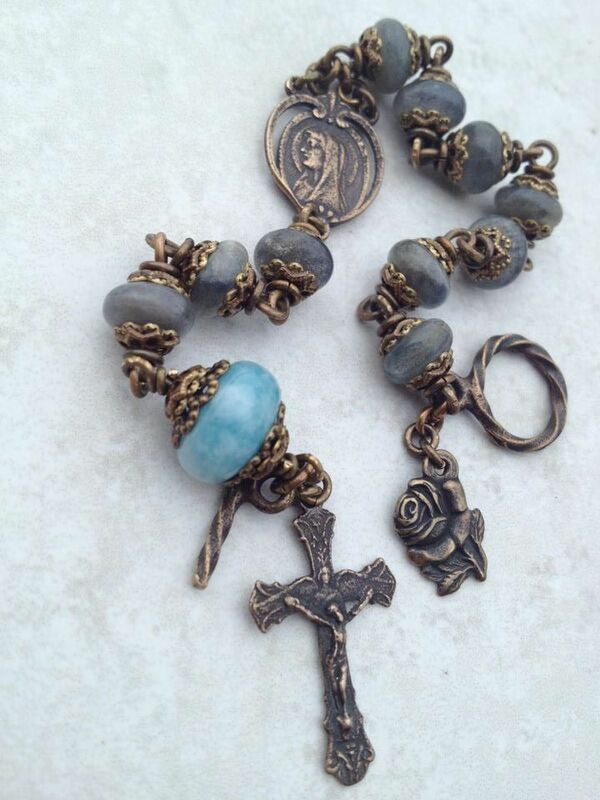 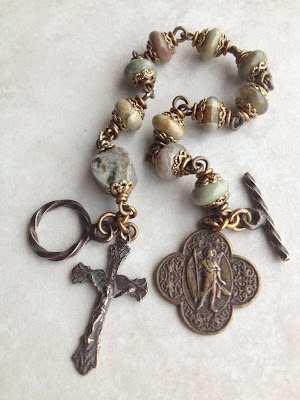 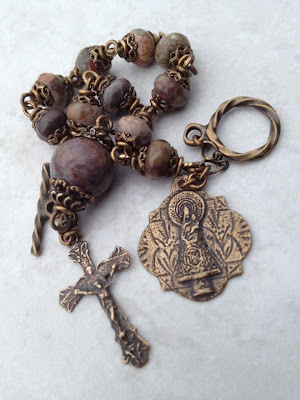 Our Lady of the Pillar Rosary Bracelet. 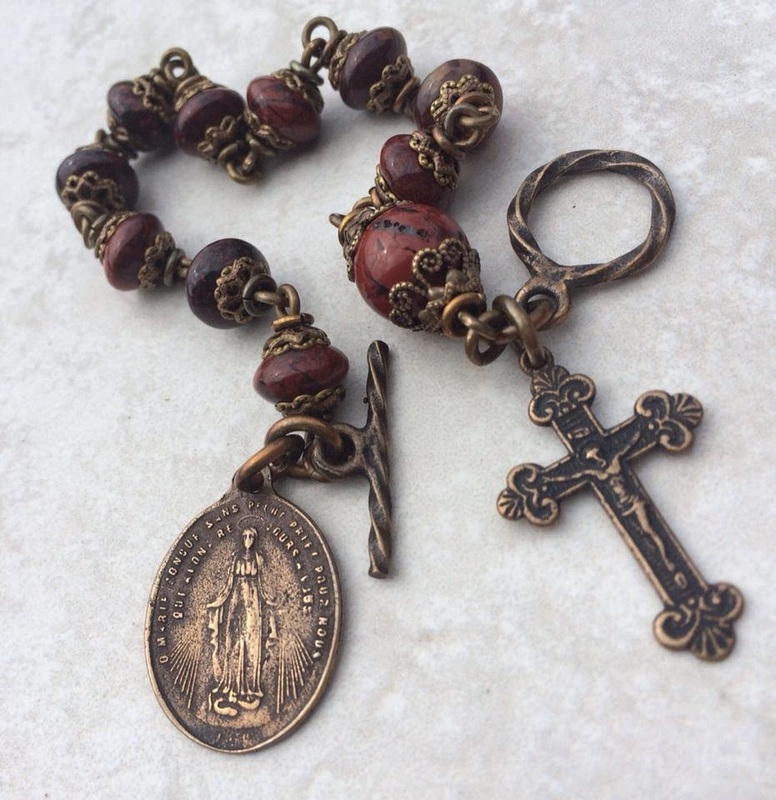 There is an ancient Catholic devotion of honouring the seven sheddings of blood of Our Lord. 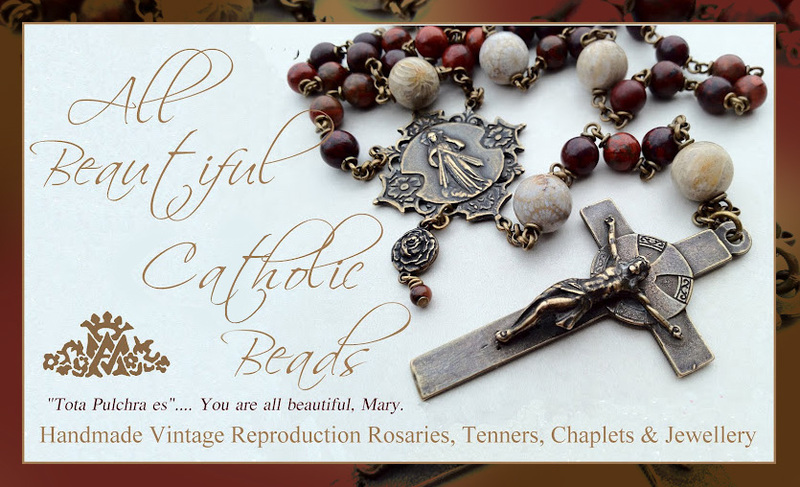 This tenner is a reminder of the first and last sheddings of the Precious Blood. 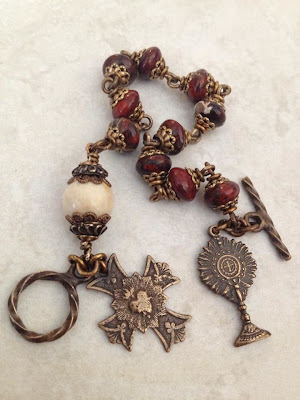 When looking upon the medal of the Child Jesus, remember His first shedding of Blood at His circumcision. 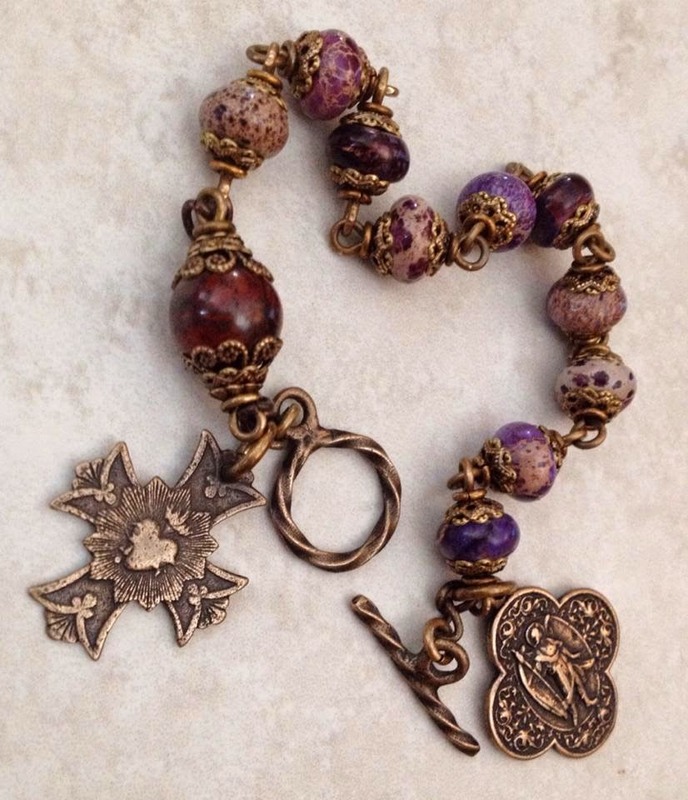 When looking upon the cross with the Sacred Heart, opened up by a lance with the Precious Blood flowing, reminds us of His last shedding ~ Blood..and water, He gave all His Blood for love of us. 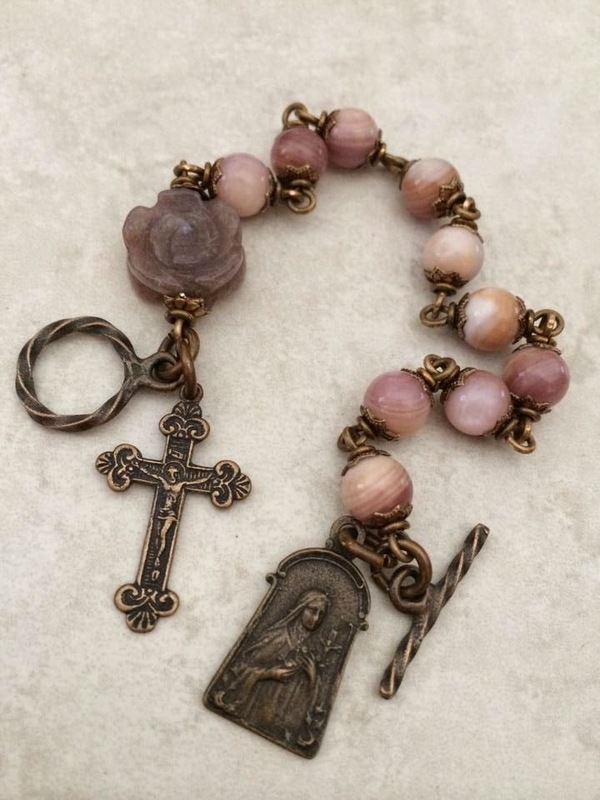 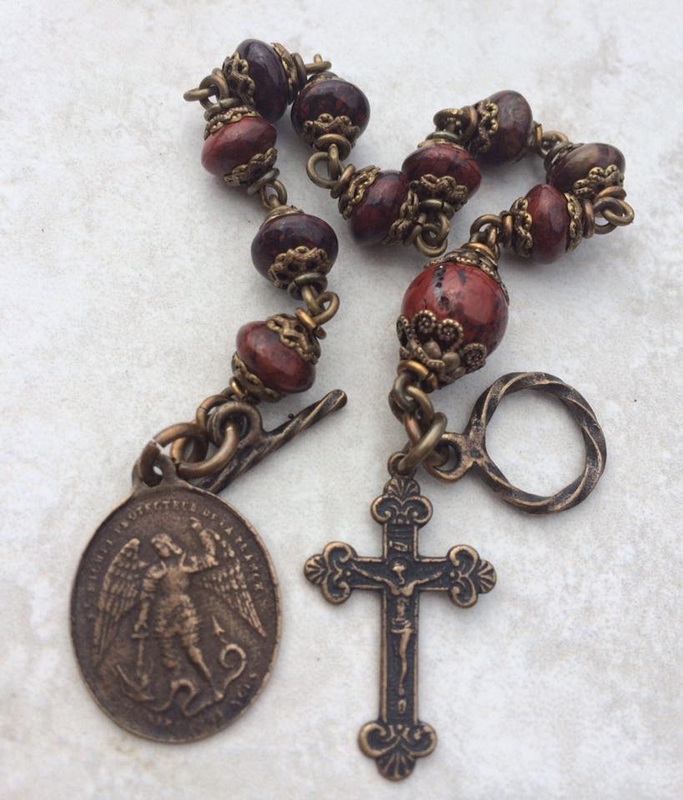 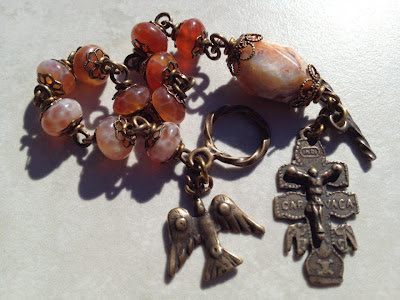 This rare quartz is one of my favourites, each bead looks as though it has encapsulated blood, so perfect with a Eucharistic themed devotional piece. 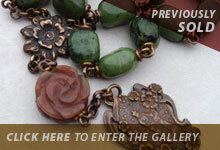 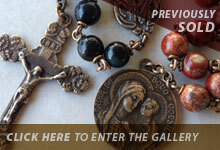 It is lovely to finger these beads through the decades as your mind naturally turns to the Precious Blood of Jesus.